Chipotle co-CEO Monty Moran has stepped down from his role effective immediately. Founder Steve Ells is now the company's sole chief executive, Chipotle said Monday. "Given the ongoing challenges facing the company, the board felt strongly that it was best for Steve to resume leadership of the company going forward," Neil Flanzraich, lead director of Chipotle's board, said in a statement. Ells said Chipotle's operations have become "over-complicated" and that the company needs to "act with a sense of urgency toward all of the changes we are pursuing" in the wake of an E. coli outbreak that has sent sales plunging. 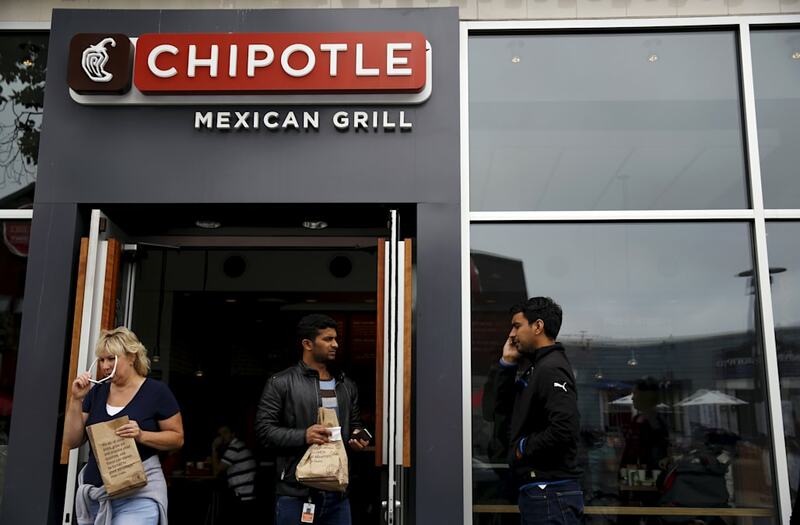 Customers have been slow to return to Chipotle in the wake of the outbreak, which started late last year. As a result, Chipotle management is suddenly getting nervous about meeting the 2017 guidance that it issued in October, Ells said last week. Chipotle had said in October that it was expecting same-store sales growth in the high single digits next year — so anywhere from 6% to 9%. In the most recent quarter, Chipotle's same-store sales dropped 21.9%. Chipotle Mexican Grill (NYSE: CMG) announced that its Board of Directors has named company Founder Steve Ells the company's sole Chief Executive Officer. Ells will also remain Chairman of Chipotle's board. Monty Moran has stepped down from the co-CEO role and from his board seat effective immediately, and will retire from Chipotle in 2017. "Steve founded Chipotle more than 23 years ago with a powerful vision to use great ingredients prepared skillfully by hand, but served very fast," said Neil Flanzraich, Lead Director of Chipotle's board. "This approach has proven to be a very successful formula, but as the company grew, operations became more complicated and less consistent. Given the ongoing challenges facing the company, the board felt strongly that it was best for Steve to resume leadership of the company going forward. This will ensure that his high standards for the guest experience and his unyielding commitment to the company's mission are top priorities." Ells, a classically trained chef, started Chipotle in 1993 with a small loan from his father. Chipotle has since grown into one of the nation's largest restaurant companies, with more than 2,200 locations in five countries. Ells served as Chairman and CEO from 1993 until 2009 when he became co-CEO, a title he shared with Moran. The company went public in 2006. As Chairman and CEO, Ells will directly oversee restaurant operations, strategic initiatives, and innovation projects at the company. "Chipotle is based on a very simple idea: We start with great ingredients, prepare them using classic cooking techniques, and serve them in a way that allows people to get exactly what they want," said Ells. "Even though it's a simple idea, operations have become over-complicated. I'm very much looking forward to relentlessly focusing on ensuring an excellent guest experience, removing unnecessary complexity from our operations, championing innovation, and pursuing our mission of making better food accessible to more people." Ells also indicated that he will pursue employee incentives that are more closely tied to the guest experience. Chipotle now pays its starting employees above the federal minimum wage and provides benefits including paid vacation time, paid sick leave, and tuition reimbursement to all employees. The company also provides stock to its General Managers upon achieving Restaurateur status. The Restaurateur program, which recognizes the company's elite restaurant managers and provides a pipeline for its future leaders, is a cornerstone of Chipotle's field operations. In recent years, however, achieving Restaurateur status has become increasingly complex and Ells is committed to re-envisioning the program by placing an emphasis on the guest experience and making the path to Restaurateur more intuitive and accessible to more General Managers. "It's incredibly important to me that we create an excellent dining experience in all of our restaurants. That starts with having great restaurant teams. To that end, I will evolve our Restaurateur program to ensure that even more of our best employees succeed and thrive at the company," Ells said. "While our plans will take some time to implement, we will act with a sense of urgency toward all of the changes we are pursuing." Ells also recommitted to the company's quest to serve better ingredients, announcing a reimagined company mission. The new company mission to "Ensure that better food, prepared from whole, unprocessed ingredients is accessible to everyone" is the next step in the evolution of Chipotle's mission-driven business. Chipotle's previous mission was to "Change the way people think about and eat fast food." Ell's commitment to expanding the company's mission can be seen at http://www.chipotle.com/ mission. "When I started Chipotle, I knew very little about the way food was raised," Ells said. "But over the years, I've become a champion for ingredients that are raised with respect for people, animals, and the environment. I will also continue to advocate for food made simply, without processed ingredients, which is the kind of food I believe should be available to everyone. I'm incredibly proud of the team at Chipotle and I'm thankful to them for helping us realize our mission of bringing better food to more and more people." "I'd also like to thank Monty for his extraordinary contributions to Chipotle over the years. Monty inspired us with his vision for an enlightened people culture, and I wish him the best as he retires from the company," Ells said.